How do you say delicious in Tagalog? ADOBO! If you’ve ever been to a Filipino restaurant, you’ve noticed the unusual use of vinegar in the dishes. Very inventive, very cool. Adobo is a classic, traditional dish and there are thousands of different ways to make it. Here’s mine. Ordinarily I’d pump up the flavors with rice or coconut vinegar, but I wanted to use plain old generic and boring white vinegar here just to show that it too has culinary use! And there’s not excuses, anyone can get white vinegar. In a big pot add your chicken pieces, vinegar, water, peppercorns, garlic cloves and bay leaves. Turn on the heat and bring it up to a boil. Cover with a lid, turn the heat down to low and let simmer for 20 minutes. Add the soy sauce and continue simmering, lid on, for another 20 minutes. At this stage you could eat the chicken. It will be delicious. But to take it a step further I love to brown the braised meat and reduce the sauce further. 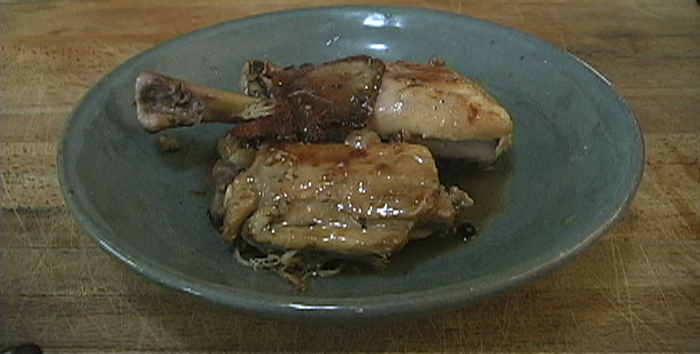 Remove the chicken pieces from the pan and set aside. Turn the heat on the pan to medium and let the sauce reduce and thicken. While the sauce is reducing Heat up a sauté pan over medium high heat and add a couple tablespoons of oil (canola, peanut or my personal favorite OLIVE). When hot, add the chicken pieces and brown each side well. Hopefully you’ll time it all just right and you’ll have reduced the sauce by half just as you finish browning all the chicken. Serve the chicken and the sauce together over rice and go crazy!